Is the Harlem Shake the New “Gangnam Style”? 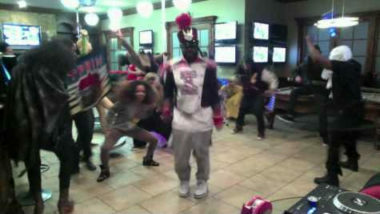 The Harlem Shake is the latest dance craze taking over the world and the Web. Quickly filling the viral void left as “Gangnam Style” grew stale, the Harlem Shake has shimmied into our collective consciousness via 30-second online videos set to the song “Harlem Shake” by New York deejay Baauer. EOnline.com broke down the details behind the dance that has us all entranced. To do the Harlem Shake, one person dances around or just humps the air for a few seconds while everyone else around them seems to act normal. Then, the beat of the song drops and everyone suddenly starts dancing wildly. There are now thousands of YouTube videos of people doing the Harlem Shake and no two are exactly the same. The original shows a bunch of guys flailing around a dorm-type room, while later versions feature people wearing costumes, groups grooving in schools and offices, and even one guy getting down with grandmothers. This is just further proof of the power of social media and its ability to turn a goofy dance into a global phenomenon. For now, it looks like the Harlem Shake is shaking up the scene as the world watches and wiggles along. To learn more about the power of online videos, contact MDG Advertising.